When Should You E-mail Students in Your Online Class? - Center for Teaching and Learning | Learning House Inc. The dynamics of communication between instructors and their students have changed significantly over the last couple of decades. Before the advent of cell phones and the ubiquitous availability of the Internet, if an instructor wanted to speak with a struggling student, he or she did so before or after class, or during pre-set office hours. Communication was limited to the brick-and-mortar campus. Today, communication is no longer bound by the walls of the classroom. Students have access to e-mail, text messaging, social media, and the phone 24/7. Further, instructors have a wealth of resources at their fingertips to communicate with their students throughout (and after) the course. Even with today’s boundless communication abilities, most students identify e-mail as the most effective means of communication with their instructor (Chang, Hurst, & McLean, 2016). For instructors, then, what are some best practices for e-mail communication? This article reviews current literature and research to help you identify when and how often to e-mail your students. Jaasma and Koper (1999) suggest that students benefit from interacting with their instructors outside the classroom. Such interaction has a positive impact on overall retention as well as improving the nature of students’ college experiences (p. 41). Heiman (2008) corroborates this finding, noting that students who receive e-mails initiated by their instructor perceived a higher rate of academic and social support. They also experience higher satisfaction with their courses (p. 245). For students to experience an appropriate level of satisfaction with the course and instructor presence, instructors need to communicate with the right frequency (Boettcher, 1999). Despite the amount of existing research on the topic of instructor communication, Woods (2002) notes that there is no agreement on what qualifies as a “sufficient” level of e-mail frequency. Most researchers leave it up to the instructor, or they provide “anecdotal rules of thumb” without appropriate empirical support (p. 378). Rourke, Anderson, Garrison, and Archer (1999) warn against excessive e-mail interaction, while other research indicates that student satisfaction is positively impacted by instructor interaction (Woods references Clow, 1999 and Phillips & Peters, 1999, among others). However, Woods’ research (2002) indicates that a high level of e-mail frequency does not impact student perception of the course, online community, or satisfaction with the learning experience (p. 385). So what is one to do in the face of conflicting research? When it comes to response time for e-mail communication between student and instructor, Floral et al. (2010) and Argon (2003) suggest that students expect responses to their e-mails within 24 hours. This is confirmed by Chang et al. (2016), whose research found that 91% of survey respondents expected a 24-hour turnaround time for e-mail correspondence (p. 6). More than half of students surveyed (57%) did not expect instructors to respond to e-mails over holidays or weekends (p. 6); however, institutions may have different requirements for e-mail correspondence over weekends and holidays. Regarding the frequency of e-mail communication between the instructor and the class, Woods (2002) helps to quantify the right number of correspondences by citing the policy of an online university in the Midwest. At this institution, online instructors are to—at minimum—maintain the same level of participation as they expect of students (p. 380). Although the number of interactions may vary from instructor to instructor and course to course, this policy helps instructors to maintain a level of visibility that demonstrates presence and availability. In addition, instructors can determine the number of e-mails to send based on the times and days of the week when students are most likely to log in to the course. The next section will cover this idea in more detail. The Learning House, Inc. (TLH) conducted an analysis of student learning management system (LMS) activity across courses launched in the spring and summer terms of 2018. TLH evaluated 17 courses from a Master of Social Work program at a private Midwestern liberal arts college, which represent a total of 322 enrollments across 240 individuals, with an average enrollment of 18.9 students per class. The data was constructed from user activity logs, calculating the length of students’ activity by finding the difference between sequential time stamps for each student for as long as the student’s IP address remained consistent. 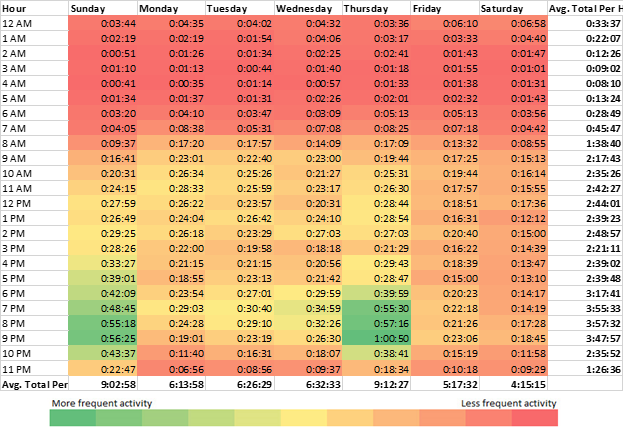 Once compiled, the total duration of student activities was averaged by the number of students in the course and organized against a day and hour matrix (Table 1). According to the data for this program, students are most active in the LMS on Sunday evenings between 4 p.m. and 11 p.m., and Thursday evenings between 6 p.m. and 11 p.m. This suggests that instructors should send e-mails during these time periods to take advantage of the high levels of student activity and ensure that the largest number of students will see their messages. For example, instructors could send out their weekly announcements on Sunday evenings. That way, students will be more likely to view information about the upcoming week, read important news about upcoming assignments, and review concepts from the previous week. Instructors could then send out a temperature check e-mail on Thursday evenings, offering words of encouragement, reminding students of upcoming due dates, or elaborating on that week’s content. It should be noted that the ideal times for communication indicated above are a result of the kinds and timing of assignments in the courses. For example, in this program, there tended to be two significant due dates each week. Many instructors required students to complete their initial posts in the discussion board by Thursdays at 11:59 p.m. The due date of all other work was Sunday at 11:59 p.m. Hence, the courses received the highest traffic on days when work was due. As such, the best time for communication will likely vary depending on when assignments are due in your class, but a good estimation is the four to six hours immediately before deadlines. If you want to gather data for your own course, the quickest way to find the high-traffic times is to use the reporting feature in your LMS. Although the kinds of reports vary across LMSs, most (if not all) give you the ability to view the class’s activity over a particular time period. Although instructors are not limited to e-mailing their students on only Sundays and Thursdays, the data culled by TLH illustrates that there are particular days of the week that are best to reach a large number of students through e-mail communication. Furthermore, sending e-mail communication two days a week helps to ensure that the instructor is active and present in the course without communicating excessively (Rourke et al.,1999). Current research indicates that, despite the availability of texting, instant messaging, and social media, online students prefer e-mail communication. By leveraging best practices in e-mail communication, instructors can ensure they are providing timely feedback to student requests and creating a sense of presence in the online classroom. In addition, student activity in the LMS is largely driven by due dates and deadlines. Scheduling regular communications with students during these time periods improves the likelihood of prompt student engagement. E-mail remains an effective tool to communicate with students in the online classroom. Students report increased learning satisfaction when instructors regularly communicate with the class. Courses generally have high-traffic days that align with assignment due dates. Instructors can reach students more effectively on these high-traffic days. Argon, S. (2003). Creating social presence in online environments. New Directions for Adult and Continuing Education, 100, 57–68. Boettcher, J. V. (1998). How many students are “just right” in a web course? Syllabus, 12(1), 45–49. Chang, C., Hurst, B., & McLean, A. (2016). How fast is fast enough? Education students’ perceptions of email response time in online courses. Journal of Educational Technology Development and Exchange, 9(1), 1–11. Floral, P. A., Turner, P. D., Monaghan, M. S., Walters, R. W., Merkel, J. J., Lipschultz, J. H., & Lenz, L. L. (2010). Faculty and student expectations and perceptions of e-mail communication in a campus and distance doctor of pharmacy program. American Journal of Pharmaceutical Education, 74(10), 1–11. Heiman, T. (2008). The effects of email messages in a distance learning university on perceived academic and social support, academic satisfaction, and coping. The Quarterly Review of Distance Education, 9, 237–248. Jaasma, M. A., & Koper, R. J. (1999). The relationship of student-faculty out-of-class communication to instructor immediacy and trust and to student motivation. Communication Education, 48(1), 41–47. Rourke, L., Anderson, T., Garrison, D., & Archer, W. (1999). 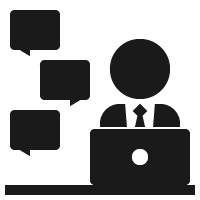 Assessing social presence in asynchronous text-based computer conferencing. Journal of Distance Education, 14(2). Woods, R. H. (2002). How much communication is enough in online courses? International Journal of Instructional Media, 29(4), 377–394.